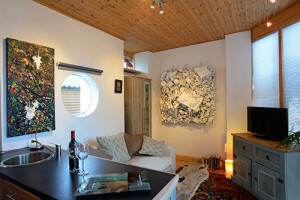 Location : Bertra Strand Holiday Apartment (2 people) on Bertra Beach under Croagh Patrick, Westport, Mayo . 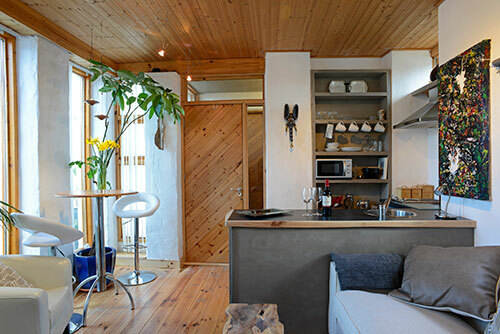 This 30 sqm holiday apartment lies on a quiet private cul- de- sac lane on the spectacular Bertra Strand Peninsular on Clew Bay on the Atlantic Way, between the villages of Murrisk and Lecanvey and 9 km from the beautiful town of Westport, with sea on 3 sides and Croagh Patrick in front. This is an ideal place to combine a beach holiday with exploring Croagh Patrick, Clew Bay and the islands. 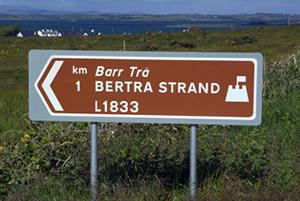 Amenities : A short stroll away is the spectacular Blue Flag Beach of Bertra with sand dunes suitable for swimming, sea-angling, wind-surfing, kite-surfing and kayaking. 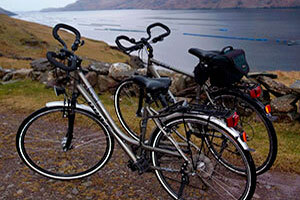 Besides watersports there is hill walking (Croagh Patrick), cycling, golf, horse riding and bird watching. 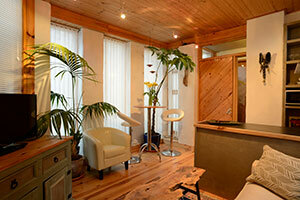 Accommodation & Facilities of this new Apartment : Small double bedroom – en-suite. 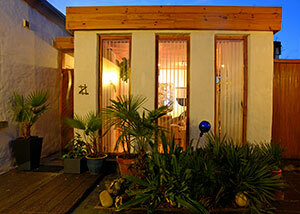 Modern bright comfortable living room with wooden floors/ceiling with art/plants features and 32″ TV. Kitchenette with double ring cooker and dishwasher. Wireless Broadband. Pond View from this apartment as located in courtyard. Small private deck at rear with table and chairs. 3 Nights Breaks : (not July / August) Please contact us for a quote). Booking Deposit : € 150.00 / week bookin g deposit low season, € 200.00 / week booking deposit high season. Paypal – You receive a paypal email request with simple secure paypal payment instructions for credit and debit cards (Paypal guarantee). Receipt : We will confirm booking deposit payment with a receipt by email as soon as the payment is logged. Payment : Full payment in cash (less booking deposit) is due at arrival. Receipt issued. Discretionary Damage Deposit : Refundable € 50 per stay – property has to be left in clean condition. No smoking or pets. Due to internal steps and deck/walkways as well as the pond with a waterdepth of 20-50 cm this property is not suitable for people with walking difficulties, babies or young children. There is no wheelchair access. 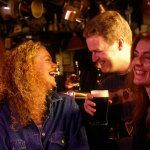 Besides the many Pubs and Restaurants in Westport and Louisburgh we have 3 local Pubs for a good pint of Guinness – (Campbell’s and The Tavern in Murrisk also serve good Food) in the local villages of Murrisk and Lecanvey (Stauntons) approx 1 mile away. Also recommended is the Shebeen Pub for food on the coast road before Westport.